Smart healthcare products are referred to the products which are connected with phone or tablets via bluetooth or wi-fi. These smart healthcare products are very efficient and can record the health information in digital format. Smart healthcare products have wide applications such as monitoring, data inventory, health data storage and others. The global smart healthcare products market is expected to grow at a CAGR of 12.8% over the forecast period i.e. 2017-2024. 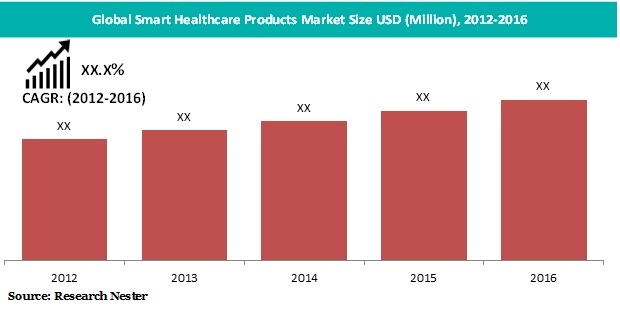 Further, the market of smart healthcare product market is driving on the back of numerous factors such as growing healthcare infrastructure, rising prevalence of chronic diseases and high adoption of technologically advanced healthcare products for the treatment purposes. On the basis of product type, the global smart healthcare products market is segment into smart syringes, smart pills, smart RFID cabinets and electronic health record (EHR). Additionally, electronic health record (EHR) accounted the largest share in 2016 in terms of revenue. Moreover, Smart pills are believed to register a phenomenal CAGR of 19.1% by the end of 2024. Apart from this, inventory management by application is envisioned to post a CAGR of 11.5% over the forecast period due to heavy adoption of smart healthcare products for data inventory. In terms of geography, North America is projected to lead the market of smart healthcare products during the forecast period aided by U.S. 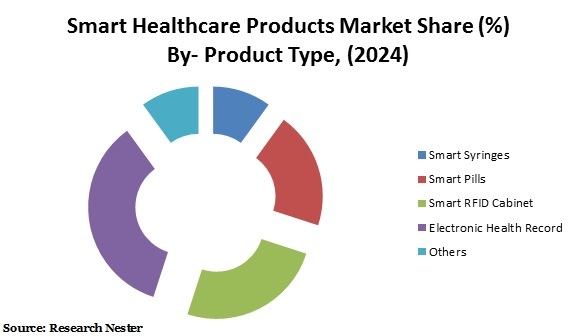 In addition to this, the growth of North America smart healthcare products market is attributed to various factors such as growing research and development activities related to healthcare products and technological advancement in healthcare products. Further, presence of major key players of smart healthcare products such as Medtronic, Inc. in North America region are believed to elevate the growth of smart healthcare products market. Europe region captured the second largest market of smart healthcare products in terms of revenue in 2016. Further, Western Europe countries such as U.K., Germany and others are believed to be the major countries witnessing the augmented demand for smart healthcare products. This augmented demand is attributed to the rising healthcare infrastructure in this region. Rising prevalence of chronic disease coupled with advancement in healthcare products for the effective treatment of the patients are expected to be the dynamic factor behind the rapid growth of smart healthcare products across the globe. Moreover, integration of intelligent technology into healthcare products and growing adoption of innovative technology in developing and developed nations such as U.S., China and others are believed to flourish the growth of smart healthcare products market by the end of 2024. Furthermore, favorable government initiatives to develop the healthcare infrastructure and rising research and development activities by major key players in the field of smart healthcare products are envisioned to bolster the growth of smart healthcare products market. Additionally, spiked penetration of smart phones is also predicted to foster the growth of smart healthcare products market. However, high cost associated with smart healthcare products are expected to hinder the growth of smart healthcare products market during the forecast period. Moreover, lack of awareness related with the smart healthcare products is envisioned to dampen the growth of smart healthcare products market.